Back in the real world from a week of skiing in the alp. This may sound strange, but when I came back I was not so exited about start painting again. Until today. A quick visit at Kristians residents and there's nothing but warhammer again, in my "real world". Now my goal is to paint all the stuff I have at home, at least most of it. So no more new stuff for me. First up, a couple of necromunda dudes. After that some Elysian and then some High Elves. Maybe I'll paint some Death Korps in between all of this. I have an idea but I'm not sure it will look good. 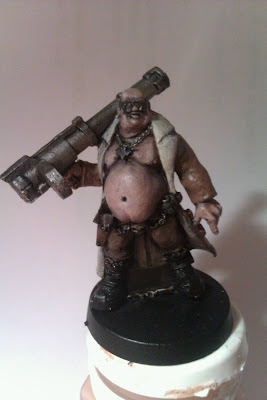 I'm thinking of painting my hole Necromunda gang in different colours since they are sewer collectors and then greenstuff a bandage on one of there arms like a gang sign. The ploblem with this idea is that all the minis look quite alike. Maybe just try different brown colours.